If you do not know a bleeding heart, please let me introduce you to a perennial dear to my heart, that thrives in our maritime Pacific Northwest garden. 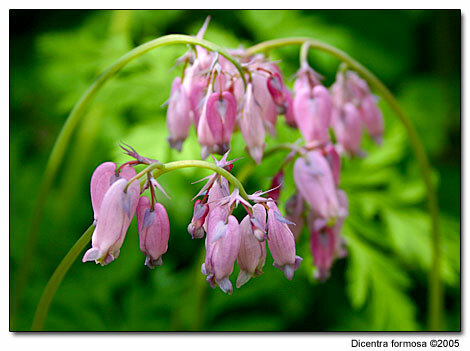 The common name, bleeding heart, may sound gruesome but dicentras add a delicate touch to a moist, woodland garden. I do not think I have ever heard a gardener speak crossly about a Bleeding heart. Most of the adjectives I hear spoken describe it as enchanting, magical, graceful, and dainty. Perhaps I hear only positive affirmations because I too am enchanted by this delightful perennial. I particularly enjoy its ferny, lacy foliage that teams well with ferns and other woodland plants. Its airiness goes well with large foliage plants such as bergenias. The flowers look like delicate jewels, much the same as a heart, with the blossoms dangling gracefully just above the foliage. D. spectabilis appears to dance in the slightest breeze with its long stream of hearts dangling from an arching stem. The flowers of D. spectabilis 'Alba' (photo top right), put me in mind of a string of pearls. Our native Bleeding heart, Dicentra formosa, thrives along the Pacific Northwest Coast in moist woods. I see it growing along the edges of woodlands, next to roads, and thriving in drainage ditches. On walks through my neighborhood, I come across stands of salmon berries and underneath them is a carpet of our native dicentras. Both flower at the same time, and when I see them in full bloom, I feel as if I am walking through a magical garden protected by a canopy of trees. In late spring, the buds open, displaying pale or deep rose pink flowers on arching stems held well above the blue-green, fern-like foliage. It self seeds in the garden, creating wonderful stands of bleeding hearts. Dicentra formosa 'Bacchanal's heart-like flowers are a deep maroon, held above finely cut, gray-green leaves. This cultivar grows most suitably in well-drained soil, in a woodland setting. I remember seeing this grow at the base of a large leaf rhododendron (Elepidotes), a few years ago. The lacy foliage of the dicentra blanketing the ground underneath the rhododendron contrasted with the shrub's bold leaves. This foliage effect looks great even when the plants aren't in bloom, a look I am duplicating in my own garden. 'Pearl Drops' - white, slightly tinged with pink. 'Silver Smith' - white, flushed with pink. The eastern sister to our native D. formosa grows along woodland edges and blooms for a long period in early spring. It then flowers intermittently the rest of the growing season. I have this growing in my garden with rhododendrons, ferns and hellebores under a canopy of a dogwood tree. 'Brownie'- pink-brown buds open to pure white flowers. 'Snowdrift' - ever-blooming, large pure white flowers. 'Snowflakes' - a new introduction from Blooms of Bressingham of North America. They report it generally keeps its foliage throughout the summer. As its name implies, it has white hearts carried above its ferny foliage from mid-spring throughout the summer, if you faithfully trim off spent flowers. Compact, 10 inches in height by 10 inches in width, D. 'Snowflakes' should be another welcome addition to your garden. When I found a Dicentra vine in a plant catalog, I decided I had to have it. I added the vine to my garden the year we moved into our new home in 1997, but I could not find any references on how to grow it. I planted the vine in a position in my garden where other varieties of dicentras would thrive. It now climbs a woodshed with ease. The vine grows fifteen feet tall and dies completely back to the ground after a hard frost. The following spring it starts to grow again, and I direct the twining vine up the shed posts. Another twining, climbing Bleeding heart, this vine has handsome, fine textured, light green foliage and yellow with purple to pink tipped flowers. This does well in partial shade but can take some sun, too, in our maritime climate of the Pacific Northwest. I am tempted to add this one when I find a vertical surface for it to grow on. More yellow hearts for the garden, but this one does not twine. Heronswood Nursery proudly lists it as a rare plant in cultivation. 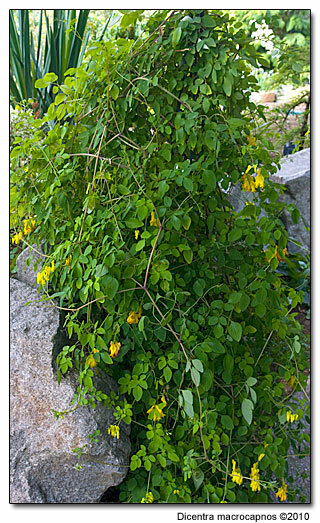 Yellow stems support ferny foliage and 3-4 inch, creamy-yellow flowers. We cannot forget the old fashioned bleeding heart. It is worth growing for its well-defined red hearts. I grow both the red one and 'Alba' in a position where their absence in summer (if they go dormant) is not a problem. A new perennial coming to the Americas out of England is D. spectabilis 'Gold Heart'. Stems of pink hearts reach three feet tall. 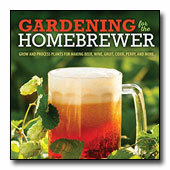 Already on my wish list for this year, I hope to add it to my shade garden. Its foliage may burn in full sun. The Dutchman's breeches is aptly named, for its flowers look like upside down pants. The only fault I can find with it is that it dies back to the ground when the heat of summer arrives. Nevertheless, it is worth growing for its white-tipped yellow pants in the woodland or shady garden. 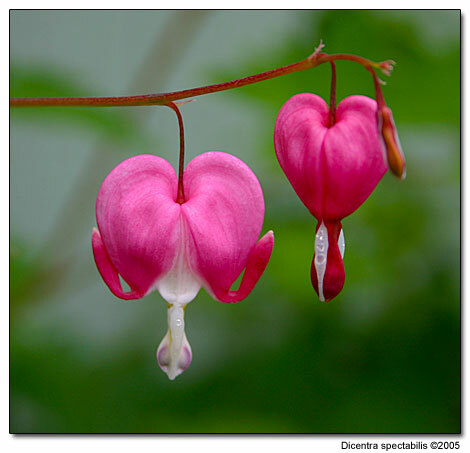 Be careful; a dicentra may find its way into your heart, but that's okay if it finds a way into your garden. Dicentras in the Plant Gallery and Growing Guide. Photographed in author's garden. Bottom image photographed in Koi Garden in Olympia, Washington.